I made this cake for a baby shower. They wanted two different flavors of cake so I made the smaller one strawberry and the larger bottom one is white cake. I baked the bottom cake in a regular 9×13 baking pan. It is doubled layered. I baked the first layer and let it cool and then iced (crumb coated it) and baked another the same size and flavor and placed on top. I then made some homemade buttercream icing, colored it blue, and iced the entire bottom tier of the cake. The top tier of the cake is also double layered. I used a small square Corning Ware dish to bake this part of the cake. I did it just like I did the bottom tier, baking one small cake and covering the cooled cake with icing and then placing the other cake on top and then covering both with white buttercream icing. After icing both parts of the cake, I used a Wilton tip 5 to create blue polka dots and white squiggles on the cake. To flatten the polka dots, either let them dry for a few minutes or use corn starch on your finger and just smooth over the dots. 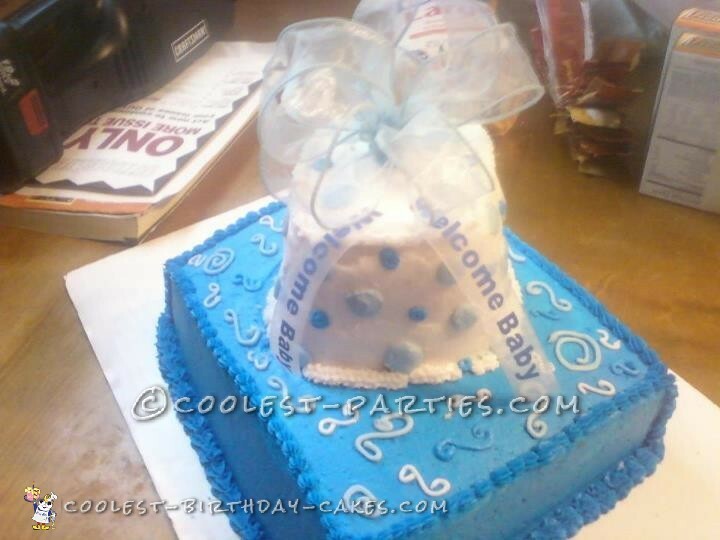 I placed two strands of “Welcome Baby” ribbon on the cake and created a bow out of sheer blue ribbon to place on top. Cake Making Tip: Instead of making one thick cake, I like to half the batter and cook two different layers and separate them with icing. To me, this provides a moister cake and I have gotten a lot of compliments on this.